Apple Watch app Cardiogram on Wednesday launched Cardiogram Premium, a subscription service that builds in advanced data sharing features that enable remote monitoring of another user's health metrics. Designed to facilitate easy data sharing among family members and doctors, Cardiogram Premium consists of two major features: Family Mode and Share with Doctor. Family Mode allows subscribers remote access to up to two family members' wearable data, including heart rate, step counts, sleep patterns, workouts, diagnostic tests, habits and more. For example, a Cardiogram user can keep tabs on their elderly mother and father without constant phone calls or email check-ins. Due to the sensitive nature of data being shared, the service is secure and entirely opt-in. To start sharing, users must first access a link with a unique code generated in the new Premium tab of Cardiogram's app. Observers must have a Premium member's link or generated code to begin monitoring. Access can be revoked by the person who initiates sharing at any time, Cardiogram co-founder Brandon Ballinger said in a statement to AppleInsider. The data sharing feature is compatible across all platforms currently supported by Cardiogram, meaning Apple Watch users can monitor data from a smartwatch running Wear OS by Google and vice-versa. Cardiogram's Share with Doctor tool is similar to a function found in Apple's Health app that enables fast and convenient data sharing with healthcare practitioners. With Premium, users can request a history of past Cardiogram data, which is provided in the form of a PDF document to be shared with a doctor. "Wearables are no longer for the worried well: the average Cardiogram user is 41 years old, and more likely than the general population to manage a chronic condition," said Cardiogram co-founder Johnson Hsieh. "The fastest-growing group of wearable owners are those aged 55 and older, and many people have told us they bought a wearable for their aging parent." Cardiogram has a strong lineage on the App Store as one of the first apps to tap into Apple Watch's heart rate sensor to provide deep insight into user heart health. Previous research conducted by the app maker, in partnership with the University of California, San Francisco, revealed wearables can detect early signs of diabetes and atrial fibrillation to a high degree of accuracy. Cardiogram Premium is free for the first month, with subscription pricing starting at $14.99 per month, $69 for six months or $99 for a year. 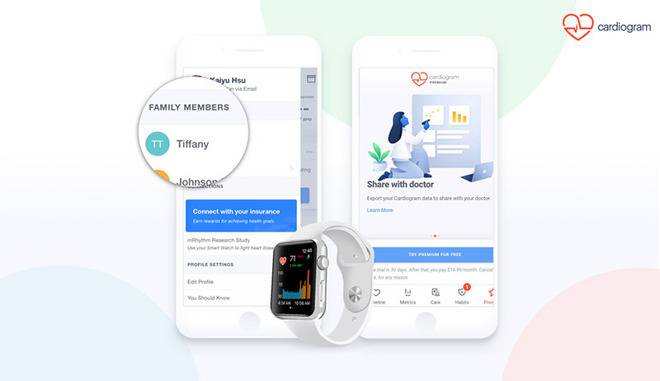 Family Sharing requires one subscription for the originating device, and observers can monitor incoming data through the Cardiogram app for free. The Cardiogram remains free to use and can be downloaded from the iOS App Store. I've been sharing data from Health and heart apps with doctor by making screenshots, then Airdropping them. This is probably more elegant but pricey, especially after seeing the doctor glance at the data for a whopping second or two before shrugging. Qardio App has had this features since it launched years ago - and for free. Plus they actually have their own medical-grade devices to do the measurements. I’ve tested the app for months with my Apple Watch as the collector of my heath regime. Checking the apps metrics page and being told your move (or any of the other 4-5 metrics is greater then 98% (or whatever) of Cardiogram users is worthless! I’ve written to the owners/developers that they needed to include “N” (the total population of Cardiogram users), and after abandoning the app for months, what is their response? A subscription service as “Premium.” What a joke. If your going to show Comparisons, hire a statistician to get it right!